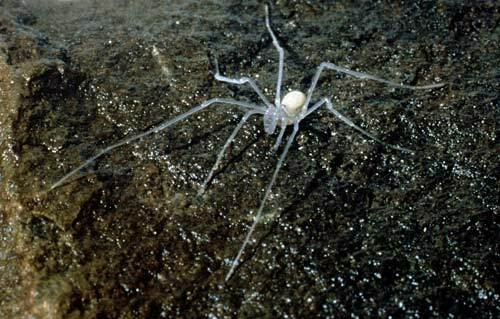 This harvestman spider in Aurora Cave, Fiordland, shows the lack of pigmentation common in subterranean life forms, which have no need of camouflage in the dark. Cave environments are marginal for many forms of life because of the lack of light (and hence food), but some creatures still manage to eke out an existence. This spider preys on glow-worms, the larval stage of a fungus gnat.